The stage was set for a dramatic contest between the Titans and the Warriors on Sunday afternoon. Not only was the majority of the crowd supporting the away team, but Ash Taylor has been the best in 2018 at engineering tries through kicks, while New Zealand have been the best at defusing kicks. 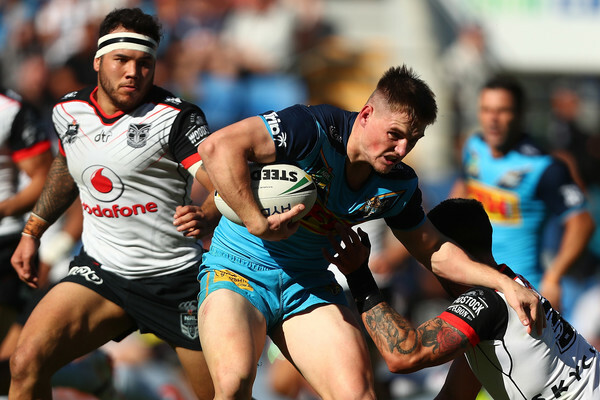 With Tohu Harris and Issac Luke out, and Blake Green in, the Warriors had a point to prove, while the Titans were keen to defend their home ground following their loss to Newcastle in Round 19. Despite Green’s return, however, he took a while to get things going. A minute in, James Gavet made the first error of the night after he was so ill-prepared for a pass from his five-eighth that he didn’t even have his hands up to catch it. From there, a penalty on Green for a strip gave Taylor the field position he needed to send through a grubber that Roger Tuivasa-Sheck was forced to punch into touch. It didn’t result in a dropout, though, since before the New Zealand fullback even made contact with the football Green had been called offside, meaning that the Titans got a chance to make a go at the line from close range. 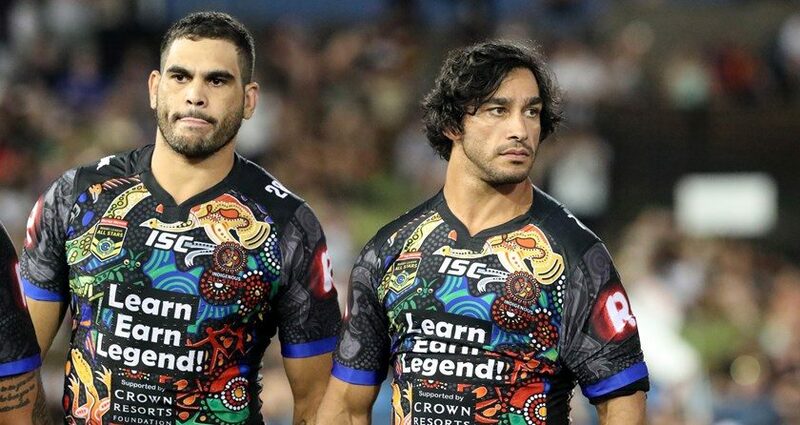 A big effort from Kevin Proctor on the right edge drained the Warriors’ defence, and when Gold Coast shifted left it was relatively easy for Michael Gordon to send Konrad Hurrell over, as the ex-Warrior fended off David Fusitua to score the first four points of the game. The call of try was actually a bit curious, due to an obstruction from Keegan Hipgrave on Joseph Vuna that was deemed minimal contact by the Bunker, despite the fact that it had sent the young second-rower to the ground. Luck seemed to be on the Titans’ side, and yet a lost ball from Ryan James on the fourth tackle of the restart, followed by a flop from Jai Arrow, gave the Warriors control of the narrative almost immediately. Now it was New Zealand’s turn to dishevel the defence, as Jazz Tevaga almost crossed beneath the posts, seeming to require about half the Gold Coast to hold him up. Finally, Green’s organisation synced, as he now sent the footy across to Shaun Johnson, who was about eighteen metres out from the line, but put in a terrific right foot pivot to scoot away from Hipgrave and then take advantage of a couple of lazy defenders to crash over beside the posts, setting up his own conversion a moment later. With ten minutes on the clock the score was 6-6, suggesting a neck-and-neck contest if both teams could manage to play with the same vigour they’d shown so far. Eighteen minutes out from the siren, Green and Taylor both attempted back-to-back 40-20s, as the deadlock mounted, and it became clear that the next team to score would stand a good chance of taking ownership of the next part of the game. For about eight minutes, the Titans now enjoyed the advantage, yet it never resulted in a try. Their dominance was built on a huge run from Philip Sami, who ran half the field after cleaning up a Johnson kick and fending off a couple of defenders, helped by a missed tackle from Gerard Beale. A cut-out pass from Taylor on the other side of the park got Gold Cpast to the ten metre line by the second tackle, where Taylor almost scored only for RTS to strip the footy from his hands. Despite having all the momentum, the Titans chose to take the two – an even more frustrating decision when Gordon missed from right in front of the uprights. A set later Brimson kicked the football into touch, and gave his team some breathing-space as the Warriors formed the scrum, only for Fusitua to lose the ball as soon as it left the huddle. With Proctor scooping it up, and Hipgrave leaking another penalty for a hand in the ruck, Gold Coast were back where they’d been a set earlier. Yet they chose to take the two once again. Whether they were spooked by the Warriors’ last try, or keen to get some closure after Gordon’s miss, it was one of the oddest decisions of the afternoon. This time, Gordon did put them two ahead, but it was a bit of an anticlimax after all their field position, and a massive letoff for the New Zealand defence, who took advantage of the time to rest and recuperate. While Gold Coast might have been in the lead, then, these two penalty options gave the Warriors the advantage. Sure enough, they were the next to score, only a few minutes later, for what would turn out to be their last points of the afternoon. After Johnson’s dazzling dexterity, the big men now stepped up, as a hard run from Leivaha Pulu laid the foundation for Karl Lawton to slam over out of dummy half, running through Hipgrave and totally oblivious to a low tackle from Nathan Peats. For a moment, some right foot dexterity from Johnson seemed about to propel the Warriors four more points forward, but a forward pass from Solomone Kata to Ken Maumalo ensured that Lawton’s remained the last New Zealand try of the afternoon. It had been a bit of an unusual opening for the Titans, since they’d had the advantage for most of the match, but had failed to back themselves at the critical moment, choosing to take the two twice in a row instead of taking a pretty low risk on another try. In order to come back over the next forty minutes, they therefore needed to start with conviction, and showcase conviction all the way until the final siren. Two minutes in, they got underway, as Brenko Lee broke through the line, sliced between Green and Mamaulo, and then sent the footy out to Anthony Don just as RTS was closing in. All it took was a missed tackle from Kata, who looked on in dismay as Don curved back inside to score directly in front of where he’d collected the ball from Lee. The Titans wasted no time in consolidating, executing a dropout a couple of minutes later. Johnson chose to go short, and the home team lost the ball, allowing Beale to scoop it up and set up the Warriors for the next set. Yet this brief fumble made the next Gold Coast sequence all the more spectacular, as Lee went from try-assister to tryscorer, intercepting a pass from Tevaga on the second tackle and running half the length of the field to cross over untouched between the posts. In ten minutes, Gold Coast had managed to restore all the momentum they’d lost with those two penalty kicks, but they were still only eight points ahead of the Warriors. A dropped ball from Taylor was a reminder than things still hung in the balance, especially once New Zealand glimpsed a sustained period of possession. Ironically, it was produced by a bit of a brainsnap from Beale, who found himself with the footy out on the right corner, but chose to kick instead of passing it to Fusitua, who was hovering around on his outside and ready to cross over. Nevertheless, it led to a dropout for the Warriors, after Sami was forced to take the Steeden into touch. While the next set might have ended with a big pair of tackles from Brimson on RTS and then Vuna, Hipgrave lost it on the first tackle once the Titans regained possession. Yet with Tevaga losing it again a tackle later, New Zealand’s brief moment had come to an end, and the Titans started to regather, starting with a terrific take from Don shortly after, as the big winger caught a Green kick – on the third tackle – at the thirty metre line and sped back up the field. Gold Coast still weren’t quite firing on all cylinders, as Brimson put down a high pass from Taylor, and a pair of near-linebreaks from Gavet and Beale saw the Warriors march their way back down the other end of the field. On the next set, however, everything came together, as Mitch Rein opened up a gap for Brimson, who dummied to Gordon on his inside and the lost the footy in the air after dancing over an ankle tap from RTS, before regathering it and scoring in prime position for Gordo to add the extras. A trio of offloads led to the next Titans try, the first of which came eight metres out from their line, evidence of how confident the Gold Coast outfit had grown by this point in the afternoon. From there, James offloaded to Gordon midway across the field, who got it across to Sami in turn. If RTS had looked ineffectual against Brimson, he seemed like another player here, reaching out a leg to trip Sami but not even making contact as the Gold Coast winger sped over the line untouched. Shortly after, Sami made it a double, thanks to a deft left sweep that featured a harbor bridge pass from Taylor, a catch-and-pass from Brimson, and a hard run into the line from Gordon, to get their no. 5 across. The Warriors wouldn’t score again, in the biggest ever win that the Titans have ever enjoyed over New Zealand – a rallying point as they prepare to take on Parramatta at ANZ Stadium next week.